Sometime last year, Sarah had scoped out that there was a place called Kookoolan Farms doing cheesemaking classes. They are $50 which isn’t a bad price at all but not so low that you wouldn’t think twice about it. We all agreed that we were interested and have been keeping an eye on the schedule. I saw that they had a Hard Cheese class for March and decided to go. Due to schedules, I was the only one of our group that could make it but I’m so glad I did. Kookoolan Farms is in Yamhill, Oregon, about an hours drive from Portland. It’s quite the bucolic agricultural area which is becoming well known for some excellent wineries as well as barley, wheat and dairy farming. The owners at Kookoolan have dairy cows and raise chickens for eggs and meat. They have a little store there where you can buy cheesemaking supplies, raw cow’s milk and farm fresh eggs. I think all of their cheese supplies are sourced from New England Cheesemaking Supply. 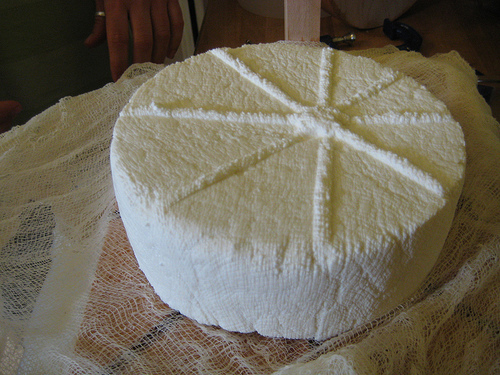 The class was taught by Mary Rosenblum, who has been making her own cheeses for over 30 years. The focus was on cheddar. You may recall in the Cheddar Incident of Aught Eight that our first go at a hard cheese didn’t turn out so well. We’ve all been talking about trying again but just trying to follow along in books and figure it out has been sort of… frustrating? Entertaining? Mixed? So, I was really excited about the opportunity to watch someone make cheese who knows what they are doing! The class was completely full with around 25 people. I wasn’t sure what to expect out of the class — I was fairly certain that it wouldn’t be too hands-on as the cheesemaking process doesn’t really lend itself to a bunch of people all cooking at once. I would call it a lecture style class. There’s a small kitchen and Mary faced us, cooking up two gallons of raw cow’s milk and explaining the process as she went. She also explained lots of things about milk: what’s in milk, what happens as it converts to cheese, what the ingredients are and how they work together. It was a ton of information but her style is really easy and it was no problem to follow along. At various times she had us come up to the pot and get a good look at what was happening, showing us a “clean break” and she put out plates of curds in their various stages so we could get a feel for the texture. I took gobs of notes and discovered a few things that we maybe could have done a little better with our cheddar. For one, we let our milk get way too hot. According to Mary, mesophilic culture will die at 102-degrees. I don’t recall exactly how hot our milk got but it did sort of shoot up in temperature, as milk will do, and stayed quite hot. I have a feeling that we did let it get too hot and that may have had an effect on the culture and the taste. It’s lovely! It’s also a great place for moisture to hang out and mold to develop. Big no-no. We can do the initial pressing as-is but for the long pressing we should bandage the sides (take a strip of muslin the size of the edge of the cheese and wrap it around) and put something flat and smooth on the bottom. Mary had a lovely little stainless steel tray that she put under her cheese. The tray had a lip that allowed whey to continue to flow away. She also had a stainless steel round that she slipped under the follower. What this does is create smooth surfaces on the top, bottom and sides of the cheese. One other little component we were missing was Lipase powder. Mary recommended always using it. We didn’t have any on hand, and I believe it was listed as optional in our book. Well, lipase is an enzyme which aids the cheese in fermentation and also adds a lot of flavor and character to the cheese — two things which our cheddar lacked. I bought sharp Lipase powder (they also had mild) at Kookoolan and I’m pretty excited to give this a try. It was $7, and I think I could get dozens of cheeses from the bottle. So, by eliminating the major issues and adding lipase I think we can go a lot further in realizing our cheddar dream. Mary also put together a big sampling of cheddars for us to try along with wine. She told us a little about each one and talked about the processes which go into them to make them distinctive from one another. It was a lot of information but I really think it was a good class, especially for someone who has already dabbled a bit in cheesemaking. Mary also writes a blog cataloging her life on her own little farm in Happy Valley, check it out. Check out our favorite books and see what equipment you'll need to start cheesemaking at home in our Amazon store. Feta! Feta! Feta! Oy! Oy! Oy! Linda Biram on Amaltheia Dairy, Montana! thomas J Simms on Amaltheia Dairy, Montana! 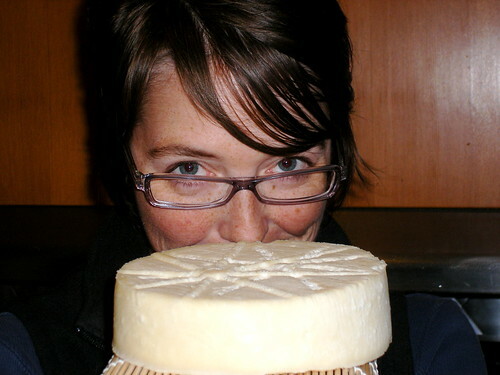 Beer + Cheese » Blog Archive » Tillamook! on Halloumi? Hallou-you! FUCheese is happily hosted by Dreamhost!